Under able guidance of trained professionals, we are able to manufacture and supply Glass Office Furniture globally. Our range is manufactured using high grade raw materials. This product is famous for its excellent design and the polished plank at the top enables comfortable writing. The elegant color grabs the attention of the buyers. Displaying a wide range of Glass Partitions which are widely used to divide a particular place in partitions through glass. 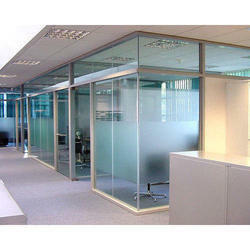 These partitions are made by using high grade glass and latest technology. We are dealing in wide rnage of Glass Partition.These products are available at competetive prices.Moreover, provided partitions are well-known in the market for their alluring design and pattern. Our clients can avail these partitions in numerous specifications at affordable prices.